Incident IQ’s next update is arriving on November 5. 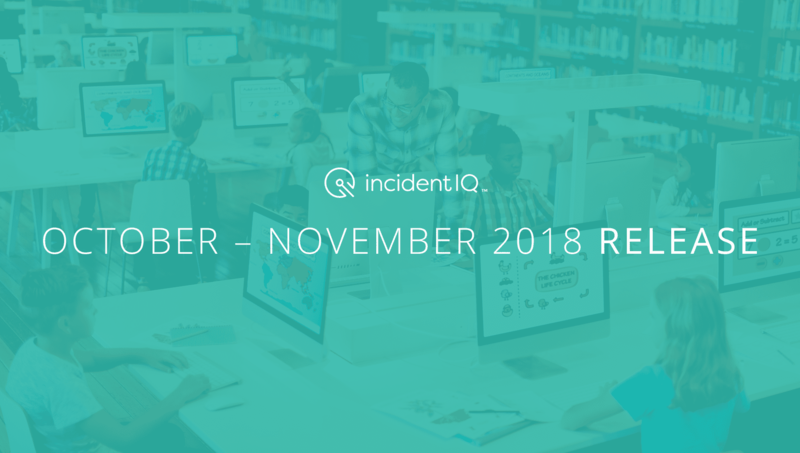 Read on to learn more about the changes found in our October and November updates, and our upcoming webinars. Building upon our survey system that we released last month, survey results can now be included in ticket filters and ticket exports making it even easier to find valuable feedback from your district’s users. In addition to filtering, survey info can be added to custom views and completed surveys can be set to display on tickets. Incident IQ’s parts management has been refined, with advanced reporting capabilities and filters based on location, part type, and date. The Policy Manager app in Incident IQ has been enhanced with the ability to filter by relevant policy information, such as user acceptance or accepted date.